Combining over 30 years of car experience and 20 years in the film industry, Billy Hammon is one of the best in the business! Since his childhood, Billy had a love for cars and motorcycles. He began sculpting his life and career at the young age of 16, competitively racing motorcycles. Shortly after, he transitioned into go-karts and came to the realization that he enjoyed building cars more than racing them. He knew this was not only his passion but something that would shape a career for his lifetime. Billy began his career working with his life-long friend, Greg Tracey. From 1993-1995, he was hired by Aciero Racing to work as a mechanic and Pit Crew in the Indy car series. That also afforded him the ability to work the world’s most famous race, the Indy 500. As the Indy Car series split, his career took a turn into the film industry. Billy began his film career as a PA for Joe Pytka. He spent many hours learning the industry. After that, Billy went to Shelly Ward Enterprises, a leading car prep company in the commercial industry. 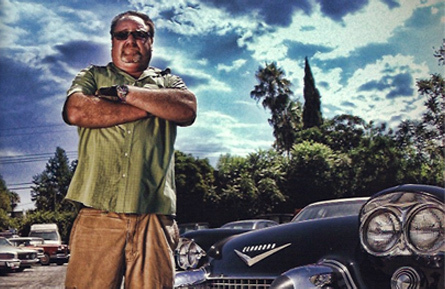 He spent 14 years at Shelly Ward building relationships and becoming more knowledgeable about the industry that combined his two passions, cars and film. While at Shelly Ward, Billy traveled the world prepping, rigging and building vehicles for car commercials such as Mercedes-Benz, BMW and Toyota. After leaving Shelley Ward, Billy joined some life-long friends to make the film, “Act of Valor,” by acting as the car coordinator for the entire movie. After the movie was completed, in 2010, Billy joined Ted Moser and Picture Car Warehouse. Later that year, he created and founded Action Vehicle Engineering. Action Vehicle Engineering was started to cater to car commercial and specialty build clientele. Upon opening this new company, Billy partnered with Mattel to create full size Hot Wheels. As the company became more of a success, the name officially changed to Action Vehicle Engineering, a name that better explained what the company does. Coupled with Mattel, Billy has been a part of 3 world records! He helped to complete the world’s longest jump of 332 feet, the world’s longest corkscrew at 92 feet and built the double dare loop for the 2012 X-Games. Billy’s extensive experience and knowledge has provided him with some amazing opportunities. He has worked on titles such as “Dust of Glory,” “Act of Valor,” and countless commercials. He has been involved with the Indy 500, Daytona 500 and 24 hours of Daytona. Billy has also had the pleasure of working with some of the industry’s best people. He has built and maintains relationships with Bandito Brothers, Mattel, Tool of North America, Radical Media, Bridgestone Tires and Dan Gurney from All American Racing. Billy has all the resources and tenacity to help make your commercial or project a success.